In Kyrgyzstan, research indicates that the population not only distrusts the court system but also knows very little about his or her own legal rights or the role of the judiciary. In one survey conducted by IRI, more than half (57%) of respondents viewed the courts negatively and nearly all (88%) called the courts either ‘somewhat’ or ‘very’ corrupt. Given this pressing need to improve legal awareness, IDLO has incorporated various public outreach activities in Kyrgyzstan via television, radio and social media to engage citizens on rule of law issues and increase public understanding of the judiciary. Most recently, as part of the activities under the USAID-IDLO Judicial Strengthening Program (JSP), IDLO launched a Court-TV series called “Achyk-Aikyn” on Kyrgyzstan’s largest public TV station, KTRK. The show features a mock trial based on a real-life scenario to educate viewers on how to seek legal remedies and demonstrate proper court procedures. Topics covered in the show include the establishment of paternity and alimony, divorce and child custody, seeking damages in a car accident, and debt repayment. Viewers of “Achyk-Aikyn” have expressed appreciation for the knowledge gained and practical nature in which the complex issues are explained. “It was informative from a legal point of view. Ways to solve such everyday problems are presented in a manner that is easily understandable to regular people,” commented one viewer. “I think this type of programming will play a big part increasing the legal knowledge of the population, especially in the regions,” said another. Likewise, in partnership with UNDP under the UN Peacebuilding Fund’s ‘Improving the Rule of Law for Sustainable Peace’ project, IDLO has also worked with KTRK to air debates on issues related to peace and conflict resolution, such as independence of the judiciary, conflict between investors and local populations, pressures from internal migration movements, and others. 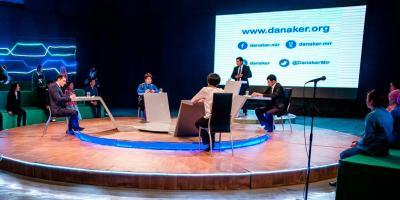 To date, four such debates have already aired. Radio programming has also proved successful in reaching a broad range of audiences in even the most rural parts of the country. Working with Birinchi Radio, a radio station that broadcasts to 90% of the territory of Kyrgyzstan, IDLO staff and experts have aired weekly call-in discussions. The programs attracted huge interest from listeners reflecting the advantage of radio in the eyes of Taalaigul Sydykbekova, the Chief Editor of Birinchi radio. Thirty-three programs have aired to date and active participation was observed from the outset in November 2015, according to Ms. Sydykbekova, with listeners calling in with their questions. Finally, working through social media, a dedicated project “Danaker” page on Facebook has also attracted over 1,700 followers. The online platform encourages discussion on topical issues in the area of human rights, national reconciliation, and development of recommendations on strengthening of the rule of law. A post on new draft changes to Kyrgyz legislation on greater access to judicial information drew over 196 likes and a discussion amongst followers. The various initiatives are increasingly working together to raise awareness of each other and promote specific discussions across their audiences. These efforts are part of IDLO’s broader work on judicial reform and rule of law building in Kyrgyzstan.